It is beautiful and well made. I love my bedroom. 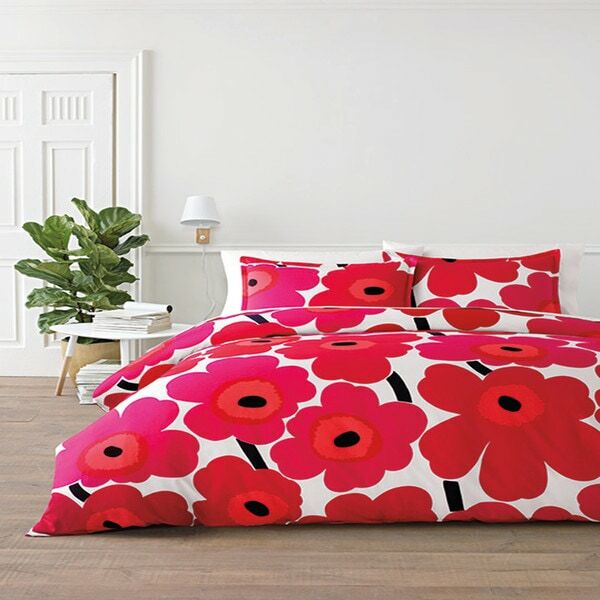 This pattern is a true classic and part of Marimekko’s first floral collection designed in 1964. Due to its perennial popularity over the years, it has become synonymous with the brand. The design has been produced in many different colors, but by far the most iconic color way is the signature Poppy Red. However, the newer True Blue color way is just as appealing and brings a modern point of view to classic blue and white. I saw this comforter *** awhile back and fell in love with it! But, it was 3 times what Overstock is selling it for. As soon as I saw it online I ordered it! The king comforter arrived in 3 days, shipped in a cardboard box, but packaged in a plastic, zippered bag as you would normally purchase a comforter set in the store. It is absolutely gorgeous! The colors (hot pink and red) are true to the online pics and having already seen the comforter before I knew what to expect. It comes with 2 king shams, no bedskirt, sheet set or accent pillow. I paired it with a hot bedskirt and it looks fantastic. Marimekko is a better quality manufacturer so the fabric was good quality, seams well sewn, no threads or off stitching. It fits my king pillow top mattress with enough overhang to fall and looks symetrical. It is not a thick plush comforter, but heavy enough for warmth and very soft and comfy. Everyone who sees it loves it! This is a feel good, I'm so happy comforter everytime you look at it! I love this comforter. The weight is great and the colors are rich, bold and vibrant! My comforter has the same flower pattern on both sides. Quality of the product was great. The colors were more vibrant than I really wanted probably because pink was the prominent color not red. Soft fabric, bright colors! Light weight comforter but keeps you comfortable. This comforter looks exactly like the picture online. If you love bright, clear colors buy this bedding! I love this comforter! It is soft and inviting and very comfortable to rest your head on after a long hard day at work. I cannot wait to find some coordinating decorative pillows. Totally brightened my room. Happy with my purchase. I love my comforter set. The color brings the room to life. It would easily have been a 5, but "reversible" when it's the exact SAME on both sides seems silly...but that is just design preference. It is LOVELY and FULL and heavy and well sewn...the edges are clean and it fits my tall mattress beautifully. Most important for me is the colors are BRIGHT...much like the picture and I LOVE IT. The fabric is quality and believe me I'm picky...this is my 10th try at a bedspread and I finally have a winner! If you love love color and quality you will LOVE it too! This is beautiful and fits my king sized bed perfectly. Oftentimes, king comforters do not cover the edges or end of the bed very well. This comforter is of great quality and it has nice overhang all all three sides of the bed. It looks awesome! I just Love everything about this Comforter. The Color is so Cute and Eye Catching! I think I'll order another To hang up on my wall! My daughter absolutely loves it! I love this comforter. I searched for months before finally deciding on this. It is great quality and the colors are bright. I also purchased the matching sheets. They are also a good quality. I love the comforter set. It was bright and pretty and just what I needed to add color to the room. The quality of the comforter was also great, not too thin or thick!!! I would definitely recommend it!!! Beautiful!! Brightens up the bedroom!! Love this! My mother came from Finland so it would make her happy to see this on my bed. I like the fact that the product looks just as it did in the photo. Good quality! Came just like pictured, beautiful color and texture. Loved it and would recommend. "What is the color of the back of the quilt?" It is the same print as the front. "I really have been looking for this in a Bedspread size king and I show it on the favorites in a size twin having problems changing it from twin to king"
"What is the size of the comforter you are selling now? Also, if not available now, when will the queen and king size be available? Thank you." "When will full/queen size be available?" "Do you have this in a king size?" "When will a queen size be available?" "I would love to have this in king size." The King size will be available later in August. The king size truly is king sized. Has an excellent drape on both sides and foot of bed.